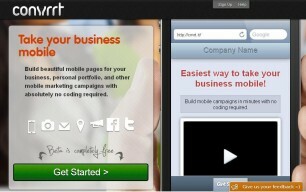 Mobile Convrrt is exclusively for the mobile platform, offering a simple, free solution for businesses just starting out. It doesn't do a heck of a lot, except let you create a basic landing page viewable on a smartphone. A free landing page builder, enticing small businesses to try it out. Despite the lack of features and tools found in most paid landing page creators, Mobilecnvrrt focuses on optimizing landing pages for mobile phones. The platform offers an easy way to collect customer data, and the editor tool is very user-friendly. Want to know if Mobileconvrrt is right for you? Your content, not templates is the focus of Mobile Convrrt. Selection – There is only one template available, fitting neatly into the size of your smartphone. 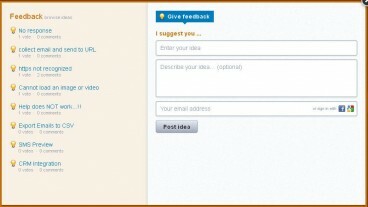 Customization – You can customize text, add images or video, email capture and submit button. Limited functionality for mobile landing pages. However, this tool allows marketers to build web pages that attract leads, via an intuitive interface that doesn’t obligate the user to write codes. You may simply choose a layout, update components, add a form and launch a landing page in a nutshell. 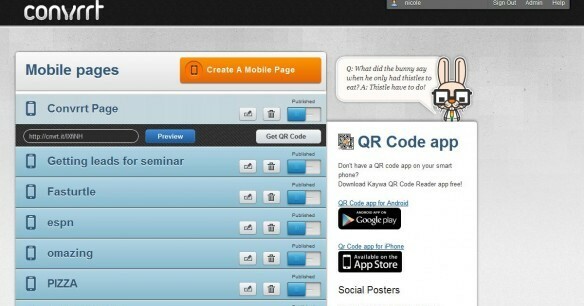 Mobile Convrrt offers the easiest editor in the market. With a limited number of features and tools that avoid clogging up the interface, and a keen eye for usability, Mobile Convrrt delivers a page in a nutshell! To build a page, click on the orange ‘Create a Mobile Page’ button, and you will be presented with a mobile phone styled layout, ready to customize with essential features such as videos, images and text. Apart from the ability to add video, contact forms, text and images, there isnt much more to talk about so don’t expect any basic testing, or custom URLS. Mobileconvrrt simple acts as a way to make a mobile phone optimized page in a simple editor. Mobile Convrrt is still in its infancy, so there is very little in the way of functionality or support. They do want to hear your suggestions regarding improvements, with a big “How Can We Make This Page Better For You?” form on the dashboard. There is a giant jpeg outlining the steps to create a landing page, but if you can’t figure out how to use this builder, you probably shouldn’t even have a smartphone. With limited functionality, Mobile Convrrt is free of charge and easy to use. Therefore, Mobile Convrrt earned a peak pricing score. 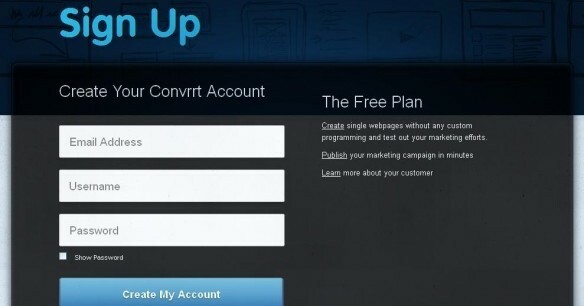 Mobile Convrrt wants to make it really easy for businesses to create and use mobile landing pages and in that area they have succeeded. Since the app itself is free (for now) it isn’t going to dent the pocketbook. But without custom domains or stats, it does have very little professional application in its present form. Like Mobile Convrrt review? Visit Mobile Convrrt.